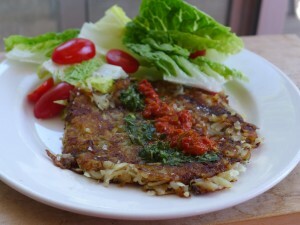 I always loved grated potato fritters as a kid. They were one of the meals that my Dad was in charge of making and they were always a treat. As well as being delicious they have a nostalgia value for me too. The originals have egg in them, but this is an egg free, flour free, lighter and slightly more upmarket version where a filling is sandwiched between 2 layers of potato. This time I made mine with a layer of delicious balsamic caramelised onions from my friend Susan who runs Saucy7 preserves, as well as a dusting of grated Vegusto vegan cheese. Here is the first layer of potato with the filling before the top layer is added. You can make these with any filling you like. One of my favourites is mushrooms. But anything goes really. Squeeze in a tea towel to remove moisture. Add half the potato in a layer at least 2 cm thick and pat down gently. Spread the filling over the potato layer. Top with the remaining potato and neaten the edges and pat down slightly. Don't squash it. It is best if the layers remain separate. Turn the heat to low and cover the pan with a lid and cook for about 8 mins. Remove the lid, flip and cook the other side with the lid on until it is browned and the potato is tender. grated potato-anything is so good. The filling is definitely making it more special! Ohmigosh, potato + caramelised onion + vegusto sounds so good right now.